Effective immediately, the Athens-Hocking Recycling Centers (AHRC) are no longer accepting “film plastics” in mixed recycling, according to an email sent to all AHRC customers last Wednesday. Asked if the nonprofit expects to accept film plastic in the future — such as plastic grocery bags, bread bags, sandwich bags and shrink wrap — AHRC Director Bruce Underwood answered that it’s possible but not likely. “I don’t foresee it in the near future,” Underwood said, adding that most recycling centers already don’t accept film plastics due to issues with contamination and the difficulties recycling the material. “Our facility was designed in a such a way that we pull them out earlier in the process,” Underwood said of plastic bags and other film plastics, some of which still makes it through the processing machinery further down the line, and has caused maintenance issues at times. Plastics “clogging up equipment and not being easily recyclable” are some of the primary reasons why most recycling centers avoid the material, Underwood said. To top it off, film plastics have low value in recent and current markets for recycled plastics, Underwood said. The market has struggled since international bans on accepting film plastics for recycling left the U.S. and other nations scrambling to find buyers. Since then, other countries have followed suit with bans on a variety of plastic materials, as well as bans on various types of electronic waste. Thailand and Vietnam each has announced bans on tech waste and plastics in the last couple of months, according to Reuters. Underwood said AHRC decided at the start of July to stop accepting film plastics. Other than the material’s low value, however, the primary reason that AHRC no longer will accept film plastics is contamination. In an email Friday, Underwood said some “common contaminates are liquids, food and food residues (from not cleaning things out or from putting food or liquids in their mixed recycling),” adding that not all film plastics are the same and they are cost prohibitive for AHRC to separate. The release suggests that individuals find alternate locations to drop off grocery bags and other film plastics for recycling, avoid or reduce the use of them, or place them in the trash. Interested individuals can visit plasticfilmrecycling.org to find recycling drop-off locations. A quick search by The NEWS found two locations in Athens where residents can drop off plastic bags for recycling: Walmart and Lowe’s, both on East State Street. Now that the nonprofit is not accepting film plastics, there should be less potential damage to machines at AHRC, which could save money. Underwood said. however, there’s still an ultimate cost. Plastic bags that do arrive at the center can also contaminate other material processing streams. “A lot of plastic ends up on the paper line, so that’s an added expense to get it out of the paper,” Underwood said. The category of materials containing film plastic and other unwanted materials is so broad, Underwood couldn’t offer an all-encompassing list. “Things like the bags that coffee comes in or potato chip bags… those are definitely landfill materials and should not be put in (recycling) bags or carts,” Underwood said, as those items are lined with aluminum and contain film plastic, as well. Plastic food wrap, cellophane, plastic-lined takeout containers, milk jugs and other materials also contain film plastics and are not acceptable, Underwood said. “If you have any questions, please do a little research,” he suggested. “Call the center, ask for clarification on what materials would or would not be acceptable… A little bit of research on the internet could” provide more information. “The good rule of thumb: if it’s really thin and flimsy… not rigid, not meant to hold liquid or food stuff in a way that a water bottle would,” Underwood said, it’s likely not an accepted material. 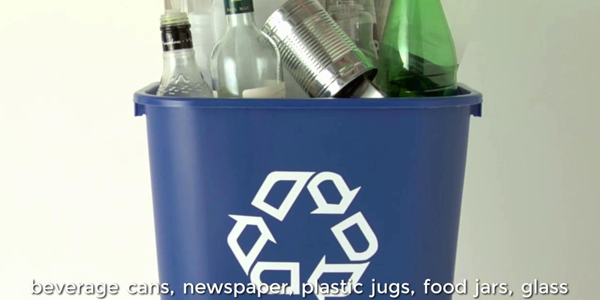 For a while now, AHRC has been offering this simple advice: When in doubt about a material, don’t place it with the recycling.